Home » The assassination of David Riccio. The Queen and Darnley continued to reside in Holyrood during the winter, and about the beginning of February 1565-6, the Seigneur de Remboilliet, ambassador from the King of France, arrived to present Darnley with the order of St. Michael, known as the Scallop or Cockle-Shell Order, so called from the escallop shells of which the collar was composed. The investiture was performed after the celebration of mass in the Chapel-Royal, and on the 11th of February the ambassador was invited to a feast, at which the Queen and her ladies thought proper to appear in male apparel, and presented each of the strangers with a “whinger” embroidered with gold. At this time two conspiracies were in active progress— the dethronement of Mary, and the murder of David Riccio, which latter plot was originally formed by no less personages than Darnley himself and his father, Lennox. 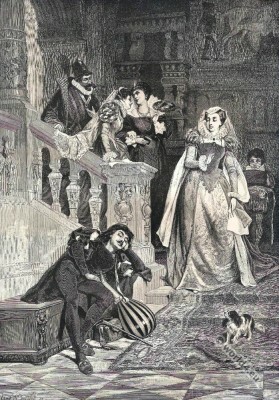 Darnley, whose enemies were powerful, was persuaded that Riccio was the sole instigator of those measures which had deprived him of the crown-matrimonial and his share of the government, for which it was too obvious he was utterly incapacitated by his habits, disposition, and imbecility. Mary had painfully discovered that her love was thrown away on one whom it was impossible to treat with confidence and regard, and an unhappy quarrel was soon the result, which the conduct of Darnley rendered every day the less reconcileable. Such was the dreadful condition of the royal inmates of the Palace of Holyrood at this crisis— Darnley the dupe of an absurd delusion— a plot formed against his life— and the ruin of the Queen projected. 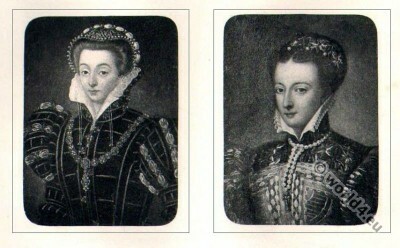 Riccio, the immediate victim of the tragedy of Holyrood, was a constant attendant on the Queen in his capacity of French secretary, and resided in the Palace. This unfortunate foreigner, who is described by Sir James Melville as a “merry- fellow and a good musician,” was born at Turin, in Piedmont, where his father earned a subsistence as a musician, had followed the Piedmontese ambassador into Scotland,and having attracted the notice of Mary, he was in 1561 appointed by her a valet of her chamber. At the dismissal of Raulet, the Queen’s French secretary, whom she had brought from France, Riccio was appointed his successor. He appears to have been unpopular from the first, and his officious interferences soon rendered him an object of bitter hatred. As to his personal appearance, he was by no means prepossessing, and indeed it was expressly stated that he was advanced in years and deformed. This was the person against whom Riccio’s enemies embraced the opportunity of exciting the weak mind of Darnley to such a degree, that he sent his relative George Douglas, on the 10th of February, to implore Lord Ruthven, in whom he had the greatest confidence, to assist him against the “villain David.” Ruthven was then so unwell, that, as he himself says, he was scarcely able to walk the length of his chamber, yet he consented to engage in the murder; but though Darnley was sworn to keep the design secret, Randolph revealed it in a letter to the Earl of Leicester nearly a month before it was perpetrated. In reality, however, the first conspirators against Riccio were the Earl of Morton, Lords Ruthven and Lindsay, and Maitland of Lethington, the last ingeniously contriving to make Darnley the patron of the plot, and the dupe of his associates. The Parliament was opened by the Queen in person, who rode from Holyrood to the Tolbooth, near St. Giles’ church, in “wondrous gorgeous apparel,” early in March 1565-6. Mary requested Darnley to accompany her on the first day to the Parliament; but he preferred riding to Leith with “seven or aucht horse” to amuse himself. The murder of Riccio soon dispersed the Estates. On the evening of Saturday, the 9th of March, about five hundred persons surrounded Holyrood, the Earl of Morton and Lord Lindsay kept guard without, and one hundred and sixty men were in the court. Mary was in that portion of the Palace consisting of the north-west towers, in the upper storeys of which are the apartments known by her name. These are reached by the staircase entered from the piazzas in the interior of the north side of the quadrangle, and also by a narrow spiral stair on the north side of the Palace, near the western door of the Chapel-Royal. By this private stair the conspirators were admitted to Darnley’s apartments on the first storey. About seven o’clock in the evening the Queen was at supper in a very small room or closet, and with her were the Countess of Argyll and the Commendator of Holyrood-house, her illegitimate sister and brother, Beaton of Criech, master of the royal household, Arthur Erskine, who commanded her guard, and Riccio. 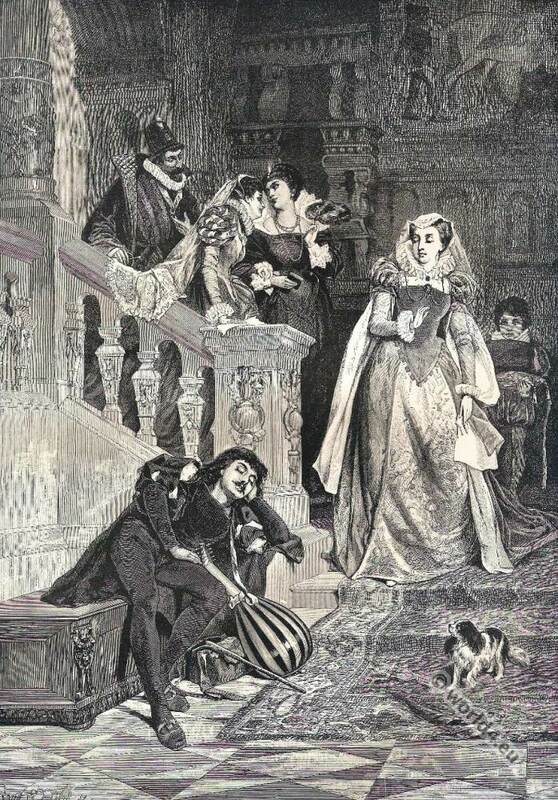 Darnley ascended the above private staircase communicating with the Queen’s bed-chamber, as if to join the Queen at supper, and threw up the arras which concealed its opening in the wall. One writer alleges, that Riccio was sitting at a side table, according to his custom while waiting, when the assassins entered; and another,2 that he sat at the table with the Queen. Be this as it may, the closet is so small that the distinction of attitude could be scarcely perceptible. A minute had scarcely elapsed after Darnley went into the closet, when Lord Ruthven, a man of tall stature, and cased in complete armour, abruptly intruded on the party. His features were so sunk and pale from disease, his appearance so repulsive, and his voice so hollow, that the Queen started in terror, and commanded him instantly to leave the closet, while her guests and attendants sat paralysed at his sudden invasion. It is stated that Ruthven, when he entered, merely wished to “speak” to Riccio; but Mary suspected violence, and Ruthven’s refusal to depart alarmed the Italian, who crept behind the Queen. All was now in disorder, the chairs, table, dishes, and candlesticks, were overturned, and Darnley endeavoured to unloose Riccio’s arms from the Queen’s person, assuring her she was safe. Ker of Fawdonside presented a pistol to the breast of the Queen, and threatened to destroy her and Riccio if she caused any alarm. While Mary shrieked with terror, and Darnley still held her, Riccio was stabbed over her shoulder by George Douglas with Darnley’s own dagger. He was then dragged out of the closet to the entrance of the presence chamber, where Morton and others rushed on him, and completed the murder, leaving Darnley’s dagger in it to show his connexion with the crime. According to the Queen’s statement in her letter to Archbishop Beaton, Riccio was despatched by no fewer than fifty-six wounds. After the murder was perpetrated, Lord Ruthven staggered into the Queen’s apartment in a state of exhaustion, and found Mary in terror of her life. He sat down and coolly demanded a cup of wine, which was presented to him. When the Queen reproached him for the dreadful crime he had committed, he not only vindicated himself and his associates, but harrowed her by declaring that her own husband was the contriver. 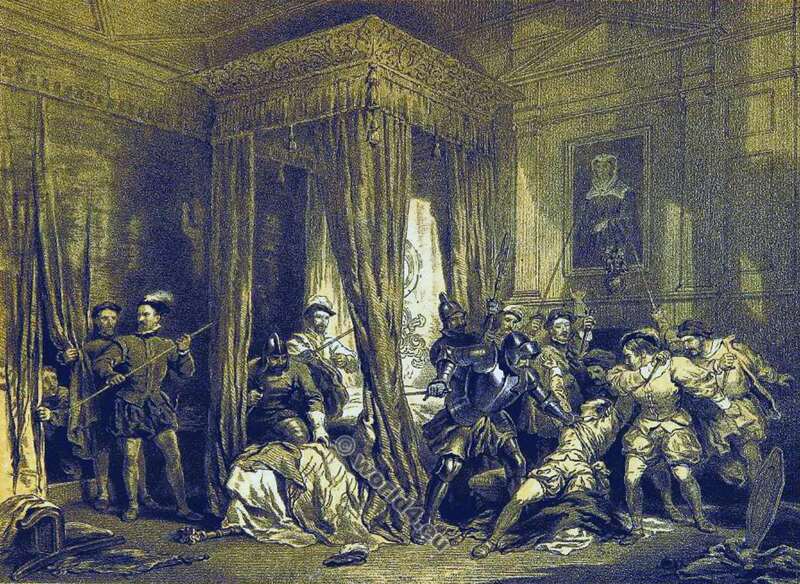 At this moment one of the Queen’s ladies rushed into the cabinet, and exclaimed that Riccio was slain, the Queen not having been till then aware of the completion of the murder. Riccio, on the night of the murder, was dressed in a night-gown of furred damask, with a satin doublet, and hose of russet velvet, and a rich jewel is mentioned as ornamenting his neck, which could not afterwards be found. The dead body was dragged to the porter’s lodge, stripped naked, and treated with every mark of indignity. It is alleged, however, on the most undoubted authority-, that the mangled body of the Italian was subsequently deposited for a time in the royal vault, beside the remains of her ancestors, by express order of the Queen— a circumstance afterwards remembered to her disadvantage. Riccio was latterly interred in the churchyard of Holyrood Abbey, which was close to the Palace. Source: Scotland Delineated. A Series of Views of the Principal Cities and Towns, Particularly of Edinburgh and its Environs; of the Cathedrals, Abbeys, and other Monastic Remains; The Castles and Baronial Mansions; The Mountains and Rivers, Sea-Coast, And Other Grand and Picturesque Scenery by Lawson, John Parker. Publisher: London Day and Son, 1860. 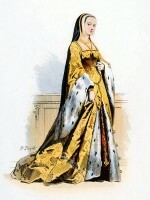 Mary Stuart, Queen of Scotland. Henry II as Captain Chevau-Légers. 16th century.